Polly Hyde did an awesome job of taking all of the Tuatara photos yesterday, but the camera went flat before her turn!! Luckily Mr T snapped a photo of her and sent it through so here it is! 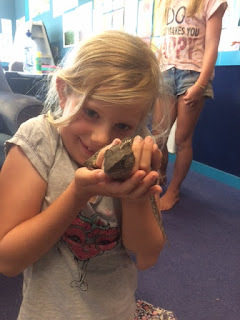 "I thought is was really really cool to see a real tuatara and my brother is sooooo jealous because he loves dinosaurs. I learnt a lot of facts about tuataras and that you shouldn't be scared of reptiles if you know how to handle them.I thought it might be a hard skinned reptile, but it was actually a bit squishy and weird. It was also cold, not freezing cold like I imagined it would be but a little bit cold. At first I was a bit frightened but the littlest kids in our class were holding it so I just decided to give it a go because I didn't want to be a 'wuss'." Love it! I am jealous too! Beth is now a guru + there's nothing I don't know about them now! But think she may have misunderstood when she told me they live for 4000 years.....!